In the road paved by “Ghost in the Shell,” this title also combines artfully elements of cyberpunk and action with philosophy and sociopolitical issues. The story takes place in a future Japan that has secluded itself from other countries due to its food autarky. The Sibyl System has taken over the judicial sector, by actively measuring the populace’s mental states, personality and their chances of committing a crime in the future. The resulting assessment is called a Psycho-Pass and is measured according to the Crime Coefficient index. When the measurement exceeds a certain level in an individual he is pursued and apprehended, and after surpassing a higher level, killed. These actions are implemented by the Public Safety Bureau’s Criminal Investigation Division who uses Inspectors and Enforcers, with the latter being individuals that their measurement has deemed them criminals, but they are granted a kind of pardon due to their skills in crime-fighting. The Inspectors are in charge of the Enforcers. All of them use handguns called “Dominators,” which are designed to measure the Crime Coefficient and fire only on those that surpass the limit. The Sibyl system also decrees the professional status for each individual based on their score on exams they take at school level. According to the marks in various tests, the system gives a number of professional choices. The individual has to follow one of these, with the most prestigious given to the ones with the highest scores. One of the latter is the protagonist of the title, Akane Tsunemori, who decides to join Public Safety Bureau’s Criminal Investigation Division as an Inspector. The rest of the team members are: Shinya Kogami, a former Inspector, whose crime coefficient rapidly increased during a serial killer case, resulting in him becoming an Enforcer. Nobuchika Ginoza, a strict Inspector who does not seem to like Enforcers. Tomomi Masaoka, a veteran ex police detective. Shusei Kagari, an Enforcer who was detected as criminal since the age of five. Yayoi Kunizuka, a former guitarist in a punk band who became a latent criminal after interacting with a terrorist. Shion Karanomori, an analyst, and computer specialist who functions as an information center for the team. Joshu Kasei, an old woman who is the chief of the Bureau. The story starts on Tsunemori’s first day and for the first episodes it looks like a “villain of the week” type of series. Nevertheless, as the plot progresses, a background is revealed that finds its apogee when Makishima, a terrorist who wants to destroy the society created by the Sibyl System, appears. Furthermore, in the later episodes an even larger plot is uncovered. 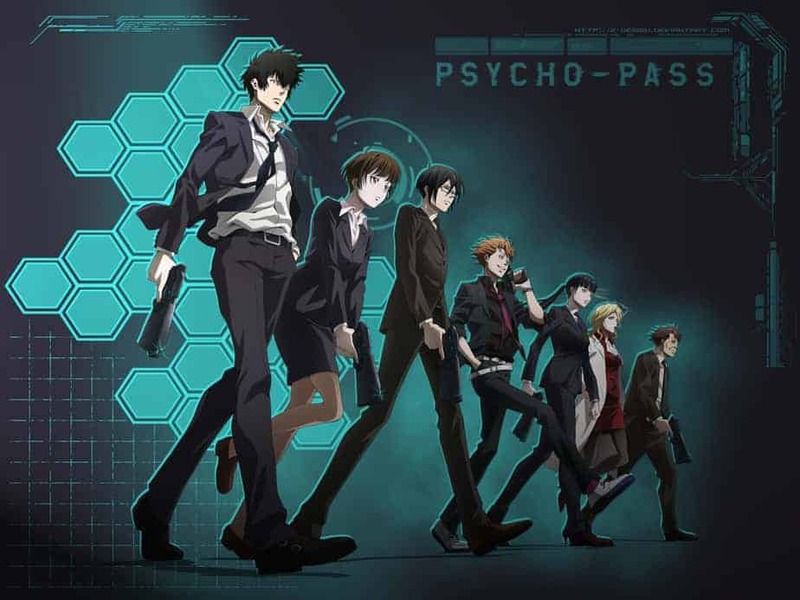 “Psycho Pass” excels in its character’s depth, which reaches a level very uncommon among anime. The majority of them are analyzed to the fullest, sometimes with separate episodes, but for the most through meaningful dialogue, that, eventually, explains all their actions, and that includes even Makishima. Apart from the characters, the anime deals with issues of philosophy, particularly on subjects like society, justice, individuality and evil. At the same time, it presents a dilemma regarding complete management through a superior authority, if a system like that could actually be implemented and what would the repercussions be on society as a whole and on individuals. However, “Psycho Pass” also includes much and impressive action, including gunfights and martial arts while it combines cyberpunk with retro elements. Violence and blood are also present, from the beginning actually, although they do not reach the point of being extreme, apart from some minor scenes. Of equal importance is the crime solving aspect, which is elaborate as the rest of the title, particularly after it is implemented into a larger frame, which eventually results in many thriller elements. There are also some elements of romance, with the obvious one between Tsunemori and Kogami, which is not, however, fully explored in the first season. Another one, quite surprising, is revealed in the last episode. Technically, the quality Production I.G. has gotten us used to, is once more present, particularly in the surrounding environment, which combines urban, cyberpunk and even baroque elements, while the gothic and grotesque aesthetics are also present. The same elaborateness applies to the overall animation, including the movement of the characters and the various vehicles, while the attention to detail is evident in every aspect. The characters’ drawing could be a little more detailed, particularly regarding the character’s faces, but this is a minor fault. Overall, the technical aspect is impressive and is definitely on par with the rest of anime.